Women of all decades love shoes, and the budget-conscious women of the 1930s were no exception. 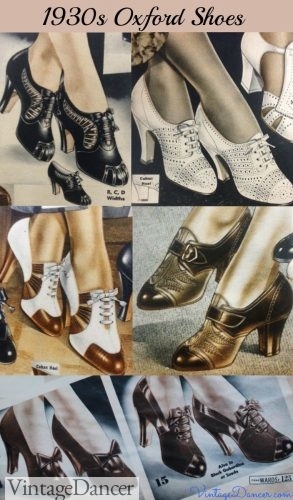 Smart pairs of stylish 1930s shoes came in a wide array of styles, but certain details made them specific to the “thirties.” Small perforations (holes) in intricate designs on the body of the shoe are a trademark of 1930s shoes, as well as thick straps, full coverage and lace-up mid heel Oxfords. Emphasis was on comfort and durability as well as price during this depression era, yet in the evenings Old Hollywood glamour inspired an elegant range of dancing heels. Women’s shoes in the 1930s were all high heels, and even sports shoes had a small flat heel. Cuban heels, Spanish heels, military heels, and built up heels were typical of the 1930s. Usually made of wood, these square heel shapes with a straight breast (inside the heel) and a curved backside graced the feet of thirties women. Heels ranged in height, 1.5 to 2.5 inches tall. Shorter heels for work, sport, and more casual looks, higher for afternoon and evening wear. Some sports shoes had a lower (1” or less) smaller square flat heel. Only house slippers and beach sandals had flat soles, and even those usually had a small heel. Oxfords, and t-straps were popular in the ’20s, ’30s, ’40s and even now, but in the 1930s they explored a creative array of decorative perforations (called brogue), die-cuts and cut-outs. The cut-outs revealed skin or were lined with a contrasting color or texture of leather or fabric to look like skin. Decorative, swirling lines and construction in contrasting colors, reptile skin, suede or patent leather gave elegance to shoe style. The higher heel on a traditionally low heel Oxford was also a 1930s style contribution. Two-tone shoes were favorites in all shoe styles, as was multiple piece construction on the upper portion, creating interesting seams and an opportunity for contrasting colors and textures. The toes of women’s shoes were rounded for most of the decade with a square toe emerging in the late 1930s. Oxfords and lace-ups, or tie shoes, have been popular for decades: classic, comfortable and chic, thirties Oxfords boasted, of course, lots of cute, creative cutouts, 2-tone styling and contrasting colors either light/dark brown, white/black, or white with other colors. Dark colors were practical year round. Improvements in leather tanning increase the range of browns from deep chocolate or light tan. Suede leather was even more popular than smooth leather, especially with accents of shiny patent leather. White was the best choice for spring and summer Oxfords. Most Oxfords had lace that tied in a small bow. Others had buckles (usually faux buckles) or simply slipped on. The slip in pump, just like today, is a classic 1930s shoe. With leather being too costly for most women, shoe designers turned to other skins such as lizard, crocodile, and snakeskin. The texture of these skins provided a new look to the dainty shoe. Most pumps were plain colors and were sold with an option of a low Cuban heel or taller Louis heel for evenings. Some fancy styles had contrast stitching, swirls, applique art deco shapes, and clip on bows. T-strap : The t-strap was super popular in the 1920s and persisted into the 1930s but with lots of quintessentially ’30s perforations and cut-outs. T-strap sandals were great for summer, and white was the most popular summer shoe color, although bright colors and some pastels were worn as well. Black T-straps remained the ideal versatile day or evening shoe for most of the early to mid 1930s. T-straps in the early years were thin and delicate with small silver buckles. Casual heels had wider straps and often added other cross straps to the design. The more straps the better! This style mimicked the look of cutouts. One-strap – Instead of a T-strap, wear a one strap! Simple and elegant skinny one-straps secured the shoe high on the instep, once again on a shoe full of delicate cut-outs, and contrasting colors. One-strap shoes are often called Mary Janes today. Monk strap shoes were a one-strap 1930s shoe with an extra wide strap across the middle of the instep, a tall vamp and tongue fully covering the top of the foot. The Monk strap buckled on the side. Monk straps were most common on an Oxford shoe, with multiple piece construction and lots of perforations. Shoes featuring removable fringe tongues gave the wearer two shoes for the price of one! While usually part of a lace up Oxford shoe, the versatility was popular enough there were even sandals and monk strap shoes with removable decorative tongues. Some shoes came with two tongues, giving the owner three different looks. Tongued 1930s shoes were practical and frugal– a perfect choice for cash strapped women. Sandals came in an assortment of breathable styles, such as slingbacks, high-heels, open toe, wedge, platforms, or a combination of these styles into one shoe. White was the most popular sandal color. Most sandals had a good 1.5 to 2 inch Cuban heel. Toward the latter half of the decade empire sandals were the new hot trend for spring and summer. A high front shoe with deep cutouts at the arch of the foot and secured by one strap high on the instep, it came in white, solid colors and the thirties favorite: 2-tones in a summery array of colors. Another trendy 1930s sandal was one with Ghillie laces. Ghillie lacing usually threaded through flat loops of the upper shoe material instead of eyelets, with the lacing points set wide across the instep to feature the criss-cross design. Like most 1930s fashion shoes, Ghillie laced shoes were graced with lots of brogues, came in two tones or came with a removable tongue. Some of the lacing designs found their way onto Oxfords too. The 1920s started the trend for the canvas saddle shoes– a two-tone low heel Oxford with a contrasting panel of color in the center. The 1930s saddle shoe expanded the low heel style into a mid heel walking Oxford. Color choices grew, too. Instead of just brown and white, they came in blue and white, tan and white, black and white, or green and white. The body could be white or colored with contrasting laces. The Crepe rubber sole replaced expensive leather and was durable, non-slip, shock absorbing and less costly to make. Read more about the history of saddle shoes including more details on the 1930s styles. Other shoe styles featured the two-tone pattern. These “sport shoes” were casual summer looks. Two-tone sandals, low T-strap heels, flat sneakers, Ghillies and Oxfords in low .5 inch heels. Two classic sport shoes are still being worn today. We call them Keds or plimsolls. They were flat rubber sneakers with lace. They usually came in white, black or brown, sometimes with a rubber cap toe. The high top sneaker, known as Converse today, was mostly worn by young men for athletics but young women could wear them, too, in white or tan. The high top design has changed little since their invention at the turn of the century. A third sports shoe was the canvas sandal with a single Mary Jane or T-strap. These were common summer shoes and more affordable than straw flats. Evening time was a chance to shine in glamorous Hollywood-inspired gowns with matching satin heels. Evening shoes had a higher Louis heel, 1.5 to 3 inch, leather soles. They were called dancing shoes, perhaps because the only time they were seen was while dancing on the ballroom floor. Black patent leather was the most versatile, but silver was the best. Gold, bronze or ivory white were other shimmery metallic colors. Some were embellished with beadwork or embroidery in the early years, while Art Deco-inspired trim found their way onto heels in the late 1930s. Cutouts of silver or gold, zig zags, or swirls were stitched on rich fabrics of crepe, suede or velvet. The look was festive yet restrained, lady like yet comfortable. Evening shoes could be pump style, but they were not the best for dancing. Instead, women wore strappy dancing sandals. The 1920s style T-strap shoe was still the preferred evening style, especially with high heels. Toes were pointed but rounded out somewhat by the 1940s. Open toe shoes were called “barefoot sandals”, ideally showing off a new fad for painted toenails. A latticework of straps secured the shoe yet revealed the foot like never before. Toes were now beautiful. Heels were not. Most stockings had reinforced heels so the slingback shoe was not glamorous. They were still worn but only with long gowns that covered the heel. Some older women continued to wear lace up mid calf boots just like they had for most of their lives. Fashionable women didn’t wear boots for day to day life. The exception was in winter when rain, mud and snow destroyed nice heels. Women protected their shoes with overshoes made of rubber. They were worn over heels. Fur lined snow boots were another option that had women carrying their nice shoes with them to change into once inside. For some sports like horseback riding or hiking tall, over the calf, lace-up boots were worn. Shorter ankle boots and even lower Oxfords made of sturdy leather were options for light-duty sports. Read more about rubber overshoes and snow boots. The 1930s set the tone for vintage shoe styles for the next 30 years and more. Oxfords, sandals, T Strap and Mary Jane’s all continued into 1940s and 1950s fashion. I look for shoes with cutouts, brogue (small holes), sandals and T-straps in white, black patent, two-tone, or metallic colors. While flats were rare in the 1930s, many of details found on 1930s heels, such as brogue or multiple straps, will look vintage enough as flats. Many of the ’30s styles are still popular today although with a modern spin on them. Check out my handpicked section of new 1930s style shoes for sale here. For vintage 1930s shoes, search or Keep in mind that most vintage shoes run narrow. Ordering a half to whole size up with help you fit vintage shoes better. i love those kind of shoes. According to Fashions of the Roaring 20’s, the 1929 Sears catalog advertised imported Mexican huarache shoes, made of calfskin, which “would become a favorite summertime sandal of the 30’s”.